Come down to Acacia Hall on the 29th November 2014 to enjoy a fun-filled 60's night in aid of the Mayor of Dartford's 31 different charities, groups and organisations. The Night will consist of some great 60's music, a fully stocked bar and fancy dress! 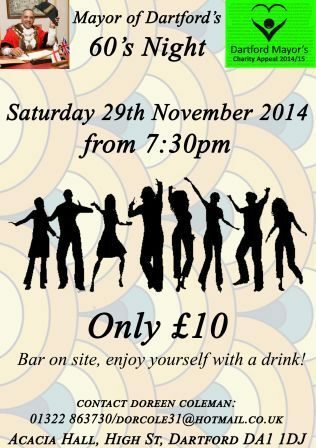 Tickets are £10 per person and will ensure a great night for all friends and family! The 60's Night begins at 7.30pm and goes on until late, giving you more of a chance to have a chat with the Mayor of Dartford Avtar Sandhu MBE and the Mayoress Sukh Sandhu.